Traveling by RV can be quite addictive no matter where the road takes you. You start out with a few weekend trips, and this eventually leads to week-long travels. Before you know it, you’re on the road for weeks at a time. RVing is addictive for travelers because there’s freedom on the road to go where you want and stay where you please on or off the road. There is one last step to becoming the ultimate RVer though, and that’s going full-time. Let’s look at why you should say goodbye to your brick and mortar home, let’s look at the four most prominent benefits of full-time RV travel. One of the most significant benefits you get with full-time RV travel is letting go of your traditional home or rental and letting go of all the associated costs as well. No more property taxes, mortgages or upkeeps costs. Granted it does cost money for campgrounds and resorts, but if you live efficiently, these costs can be much smaller than traditional living. Many RVers can find work if you need a source of income. This could be seasonal work at National Parks, maintenance, and activities at your RV resort or other easy income. With the advent of wireless technology and capabilities, many RVers still choose to work full-time jobs by telecommuting and more employers are opening up to the idea of a remote workforce. The most substantial non-financial reason that people choose the full-time RVing lifestyle is the freedom that it affords them. You’re not tied down to a concrete address; you don’t need to make stringent itineraries, book flights, or make sure there is someone to look after the dog. You can wake up one morning and decide you want to see the whale migration of the Pacific coastline or catch some giant snapper in the Gulf of Mexico and there’s nothing holding you back. Within a few minutes, you’ve unplugged your utility hookups, and you’re on your way to a whole new adventure. This also means you get the freedom to choose your climate, if Florida is too hot and muggy for you during the summer you can head to the mountains of Colorado, when that starts to get cooler you can move to the desert of Arizona. All of North America is open to accommodate you. Many full-time RVers choose an RV resort to call home base. RV resorts offer long-term leasing opportunities for people who have chosen to take on RV travel full-time. These resorts are not simple pads and bathrooms, many resorts offer stylish amenities, such as clubhouses, pools, fitness centers, and organized community events. These events and activities will allow you to meet many other like-minded people who have chosen to hit the road for good. You will find a sense of community and fun; you may even meet and make some new lifetime friends in these types of resorts. Communities like Escapees, KOA, Good Sam Club and more can bring you together with RVers across North America. Another great reason to choose full-time RVing is the quality of life that it affords. 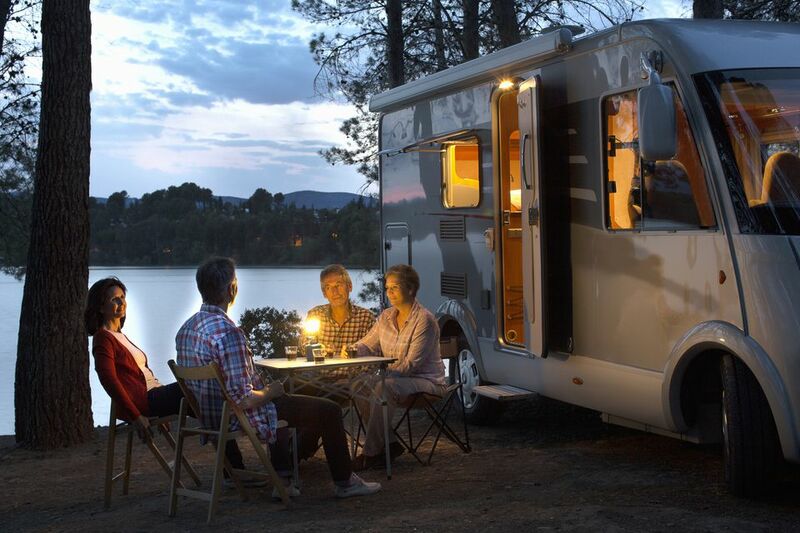 People who RV are more likely to be active, enjoy the great outdoors and live a healthier lifestyle. All these factors are shown to contribute to happiness and quality of life. Not to mention that many people who RV together report that they develop stronger relationships and bonds due to the RV lifestyle. Full-time RVing allows you to get away from it all, see the country the way you want, and do it on your timetable. You can come and go as you please which can bring you comfort, relaxation, and adventure all at once. Full-time RVing puts you into control over how you live your life and where you go to do it. There are many other small benefits of going full-time, but these are some of the major ones. Browse some RV forums and talk to other full-timers to get a better idea of what life is like before you set off on your own. Full-time RVing isn't for everyone but when you realize what an RV can do for you, and your family, it's hard to turn your back on the opportunities and freedom it affords. RVing full-time isn’t for everyone. If you’re not sure if it’s right for you, consider a month to six-week-long RV adventure and see how you feel when you return home. Drive longer than you have before, visit places you never thought about trekking, and find dry camping or boondocking locations to get a taste of all the different facets of RVing. From there, you can decide whether the full-time life is right for you.